Viva Republica, the company behind Korean financial services app Toss, has closed a $48 million Series C funding round that includes a strategic investment from payment giant PayPal. The deal is PayPal’s second investment this year — coming just days after it backed health startup Virta — but the round was led by San Mateo-based VC firm Goodwater Capital, which led Viva Republica’s Series B round and counts Korean tech giants Kakao (messaging) and Coupang (e-commerce) among its portfolio. Bessemer Venture Partners, Altos Ventures and Partech Ventures also participated in the round. Viva Republica is known for Toss, a financial services platform that started out tackling Korea’s archaic payment system. The pain of cumbersome online payment processes is what drove former dentist SG Lee to start the business two years ago, and today Toss has processed more than USD $3 billion in transactions from a base of 6 million registered users. “Before Toss, users required five passwords and around 37 clicks to transfer $10. With Toss users need just 1 password and three steps to transfer up to KRW 500,000 ($430),” Lee said in a statement. Over the course of its founding, Toss has gone beyond peer-to-peer transfers and branched into consumer financing. Inspired by the likes of Kredit Karma and Mint.com in the U.S., it launched a financial dashboard, credit scoring and micro-loans (with one-minute decisions) in a bid to make financial services “as frictionless as possible” in Korea. Lee has his sights on extending the business further still. This year, he told TechCrunch, Toss will introduce a loan marketplace to provide further credit options, micro-insurance, and TransferWise-style cross-border money transfers. That’s where a large chunk of this new funding will go, as well as helping increase awareness of the Toss service from its current crowd of tech-savvy youngsters to the older demographics in Korea. 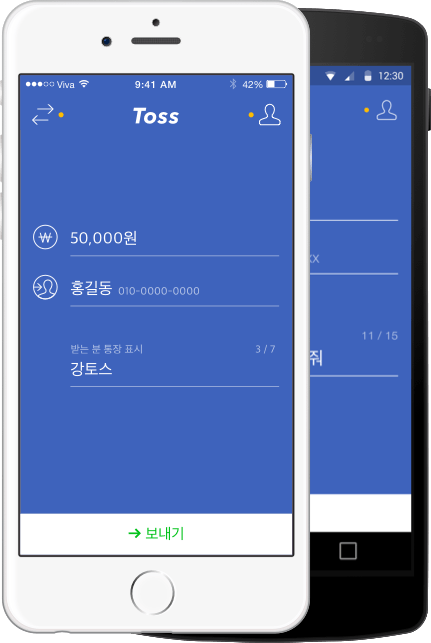 “Toss is on track to serve 50 percent of Korea’s millennials by the end of this year and have a solid product road map to launch services for all user groups as well,” Goodwater Capital’s Kim said in a statement. While Korea has a tendency to be overlooked in Asia — China’s vast population and the emerging potential of India and Southeast Asia catch the eye of tech firms — Lee said he believes it has all the ingredients for a financial tech revolution. For one thing, it has the world’s highest smartphone ownership rate, while some 80 percent of consumer spending is via cards. Kim added that credit and debit card holders in Korea average nearly double the number of monthly transactions compared to the U.S. Yes, Korea’s population is just 50 million people, but it is the world’s eleventh largest economy. “The market is huge and ready to embrace really great financial service but nobody is pushing forward for it,” Lee said. One company also making moves in finance is Kakao, the country’s dominant chat app that claims to be installed on 95 percent-plus of all smartphones in Korea. Kakao, which paired with rival Daum in a multi-million-dollar merger in 2015, launched a consumer payment service last year, but it has enlisted specialist help to broaden its focus. Ant Financial, the Alibaba affiliate that manages its Alipay service, China’s dominant mobile payment system, led a $200 million invest in its Kakao Pay division last month. Tencent, another gargantuan Chinese tech firm, is also a founding investor. Kakao may have a consumer audience and two vastly experienced investors, but Lee said he doesn’t fear the threat. Toss, meanwhile, has gone down the consumer finance route. Rather than ripping it all out and starting again, Toss works with the existing financial system. The service counts 18 of Korea’s 19 major banks as partners for facilitating payment and offers various other banking services. The startup has plenty planned for this year, but outside of Korea Lee did admit that it will make a decision on international expansion before 2017 is out. Initially, his focus appears to be on Southeast Asia, where he sees parallels with the state of fintech in Korea from a couple of years ago, and that could be where the relationship with PayPal could come into play. With a strategic investment from PayPal, working in a more tactical way going forward would make sense for the companies. Lee said that he is open to integrating the Toss service with that of PayPal and Venmo, which was acquired via its acquisition of Braintree, in the future. For now, though, he clarified, there’s nothing to report on such an alliance.